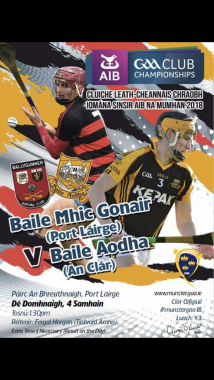 Traffic restrictions will be in place around Walsh Park for the game on Sunday between Ballygunner and Ballyea. Vincent White Road (the back of the Convent) will be closed from the roundabout at the Veterinary Surgery and all traffic will be diverted through Cannon Street. Access through Manor Lawn will be for residents only and parking will not be permitted on the greens. Keane's Road will be closed in the vicinity of Walsh Park. Please ask your members and supporters to park sensibly, refrain from parking on greens, avoid causing obstructions to entrances or footpaths and allow wheelchairs the ease of access in the area.